The Rev. 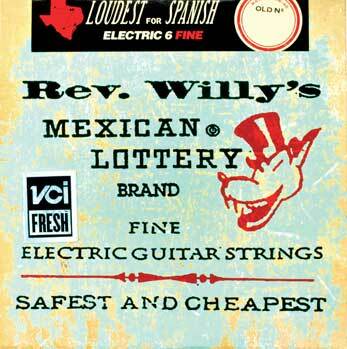 Willy's Lottery Strings were designed in collaboration withBilly Gibbons for a righteous big Texas tone. Soulful, rich, articulate and smooth sound. Billy Gibbons' big fat Texas tone has been described as ''hot, blue, and righteous''. Developed with Billy himself - aiming to make strings that offer a real punch and still stay articulate and clear when performing his legendary leads and pinch harmonics. Made in USA.